I’ve been gradually nesting and making the house cozier with blankets, cushions and odds and ends. Since the changes in the kitchen this summer, it’s been fun changing up the mantel/shelf in the dining/homeschool area. As seems to be the trend, I’ve tried to create my vignettes without purchasing anything. 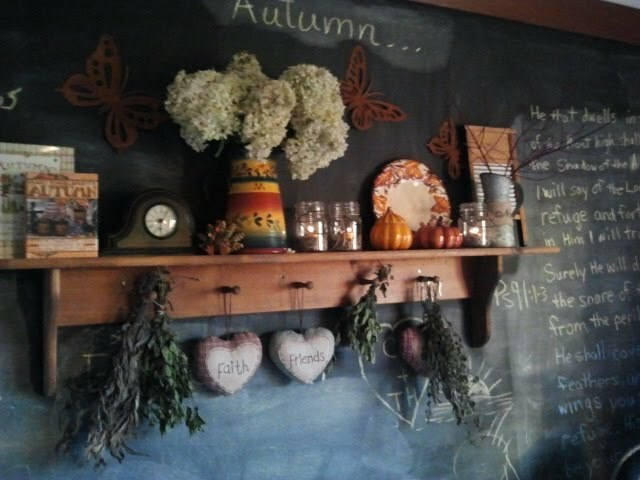 My hydrangeas were stunning this year, here’s some dried ones, and the herbs I hung to dry here, work in with the decor. 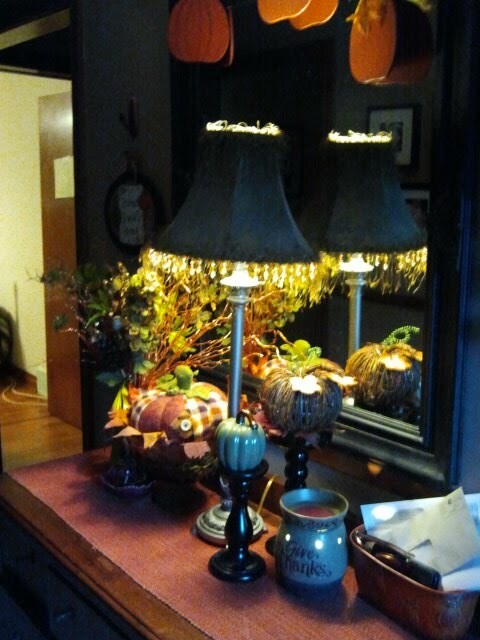 The lighting here is terrible, but here’s a first glimpse of the vignette in the entryway. I have absolutely loved highlighting ORANGE in my decor again. As much as I appreciate the neutrals, I need the splashes of colour inside my house as well as outside in the changing landscape. 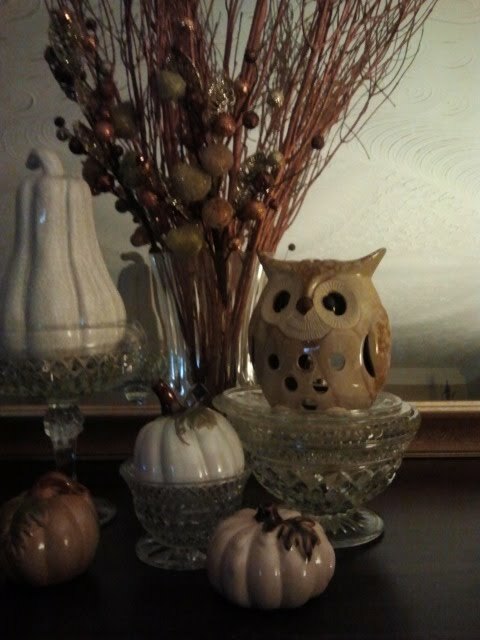 Here’s a small neutral toned vignette one that I used my dollar store owl in. Again, sorry for the picture quality, all I’ve got right now is my phone camera… ha! I’ve decided that my family room will employ the “retro cottage” look – we’re employing a VERY multi-coloured palette (thanks to employing all the handmade afghans and quilts we’ve acquired through the years. This school year I’ve decided that our homeschool will be a part of our home rather then stuff we pull out and put away all the time, so my bookshelves in the living room are jam packed full of books and supplies we use all the time, so I’ve not used much fall decor in the room, but the cozier feel is definitely here because of the extra books and blankets – and the fact that we’re using them! Anyways, I’m linking up to a fall linky party to keep my momentum going around the house and to savour each and every moment at home with my lovelies.